Here's a little card idea for you when you just need to send a fun card to a friend. 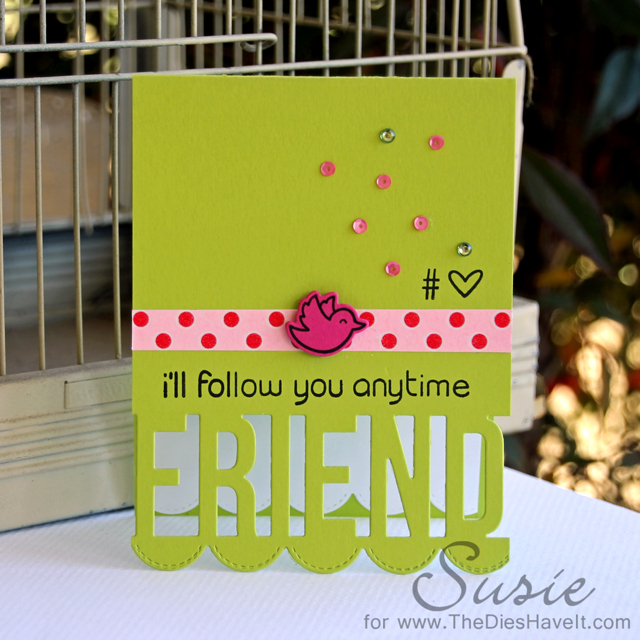 The die that cut the word FRIEND from the card front is from MFT Stamps. Last month it was a free with purchase gift. But tonight you can buy it if you don't already own it. The new MFT Stamps release is tonight and I can hardly wait. There are tons of Valentine stamps and dies that I just have to have! The stamps (and tweet die) that I used are from Lawn Fawn. I thought they were the perfect complement to my FRIEND die cut front. Of course the sequins are from Pretty Pink Posh and the gems are from Eyelet Outlet. I just wanted to point out that I very rarely use colored card stock to make my entire card. But the newest card stock from MFT Stamps is thicker and it is perfect for card bases. Just FYI. I'll be right back here tomorrow with a fun new card for you and also a link to a great challenge blog.